Christmas cake is synonymous with Christmas. 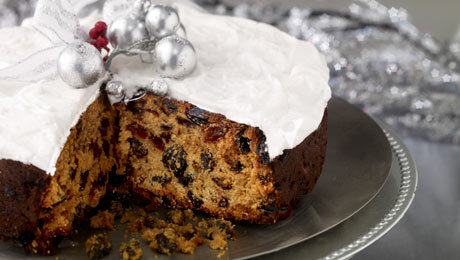 Everyone in our house loves Christmas cake and with this recipe so too will everyone in yours! Using double thickness grease proof paper, line the base and sides of either an 8 or 9 inch cake tin. Tie a double band of brown paper around the outside of the tin. The paper helps absorb some of the oven heat and protects the cake from overcooking. Mix the dried fruit, cherries, candied peel, almonds and ground almonds together. Stir in the lemon rind and juice, whiskey and grated apple. Leave on one side while you make the cake mixture. Cream the butter and sugar until light and fluffy. Gradually beat in the eggs. Sieve the flour and spices, and fold in half the flour into the cake mixture. Stir in half the dried fruit mixture followed by the remaining flour and dried fruit. Stir in enough treacle to darken the cake. The mixture should have a soft dropping consistency. If it looks a tad dry, add a dash of whiskey. Spoon into the prepared tin and make an indentation in the centre of the cake. This helps ensure an even rise. Bake the cake for about 3 hours, until it's firm to the touch. When the cake is pierced with a skewer, it should come out clean. If it looks as if it's getting too brown in the oven, cover the surface of the cake with several layers of grease proof paper. Leave to cool in the tin before turning out onto a wire rack. Don't bother taking the grease proof paper off though. Pierce the cooled cake with a skewer and drizzle over a couple of spoons of additional whiskey. Do this a couple of times while it is maturing - once a week should be enough depending on how moist you like your cake. Delicious cake. After Chrisrmas tried unsuccessfully in about 10 Supervalue Stores to purchase at least another one. Not surprised all sold out. Good Luck Kevin. I have been around for 79 years and without doubt your cake surpassed all.